Of course, your full-service oil change will top off your fluids. But it’s a good idea to have some of everything at home in case you need to top something off yourself or to take on a trip. Ask your Irvine service advisor at Autobahn West or check your owner’s manual for fluid specifications. Mission Viejo drivers’ current vehicles have over a century of engineering behind them. They have evolved into complex and powerful machines. Developments in their engines, however, have coincided with advances in many other vehicle components, including the fluids. It’s key for Mission Viejo motorists to always use the right type of fluid for their pickup. Your service advisor and your owner’s manual are resources for auto advice on exactly what types of fluid your vehicle needs. Improper fluids can damage your vehicle and void your warranty. Some of the fluids that have changed significantly in recent years are cooling system fluid, brake fluid, transmission fluid and motor oil. Each of these comes in many varieties now, and it’s key to know exactly which one your pickup needs. Most vehicles used to require Dot 3 brake fluid. But now many vehicles need Dot 4 or Dot 5. Some Mission Viejo drivers mistakenly think the higher numbers reflect an increase in grade—that Dot 4 is somehow better than Dot 3. But the truth is, the numbers represent variations in formulation. The different formulas have evolved to meet the demands of newer and better brake systems. 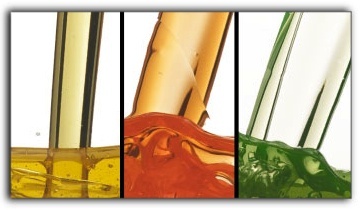 For a long time, transmission fluid came in two varieties: regular and friction-modified. But transmissions have come a long way recently, and so have the fluids that protect and lubricate them. There are several new types of fluid on the market, but your pickup is designed for just one of them. Of all the automotive fluids, motor oils have experienced perhaps the greatest advances in engineering and technology. A number of new weights and formulations have recently been developed to meet the needs of modern engines, which have more parts and tighter tolerances than ever before. Engines have become more sophisticated and complicated, but they have also increased in power and fuel efficiency. Despite these changes, Mission Viejo auto owners still need them to be highly durable. Specialized motor oils have also been developed for high-mileage vehicles. If your pickup has 75,000 miles or more on it, you might consider switching to one of these motor oils. They contain extra detergents that help clean older engines and vital additives that condition seals and gaskets that can become brittle with age. High-mileage motor oils come in weights and types just like regular motor oils, and Mission Viejo auto owners should match the proper weight and type of high-mileage oil to their vehicle in the same way you would regular motor oil. Over time, vehicles have developed in complexity and variety, and their fluids have developed as well. Each vehicle is matched to a set of fluids that meet its specific requirements. CA vehicle owners should take care to learn their pickup’s fluid requirements before topping off at home. A large part of preventive maintenance for Mission Viejo drivers is making sure your vehicle’s fluids are clean and adequate, but they must be the proper type as well. As our pickups become more sophisticated, car care becomes more sophisticated as well. Learning about proper fluids for your vehicle will help you maintain its performance and prolong its life. Talk to us at Autobahn West in Mission Viejo.